Bored On Board? Not Us! When I was younger, I never thought of taking a cruise. My preconceived notion was that there would be nothing to do and I’d be terribly bored. After my first cruise, I realized that I could make the cruise just like my regular life – busy and fun. 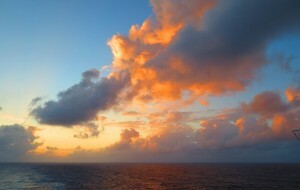 For this blog, I’ll give you a view of a typical day on board our cruise. This particular cruise is an interesting case study because it’s twenty-five days long and has only six port days. What do we do when we’re trapped on board all day long? We get up very early because we discovered an older Chinese man that does Tai Chi every morning. He’s been doing it for forty years.1 He loves teaching it and by now has a small group of us meeting him on deck every morning at 8:00AM. Because this cruise goes from California to China and Japan, a big percentage onboard are Chinese. We noticed that there are also Xi Gong, Chinese dance and other Tai Chi groups in the morning. We wake up before 7:00, have a small breakfast and coffee, and then spend the better part of an hour doing yoga stretches. Now that we’re below the twenty-third parallel, we practice outside. We put lounge cushions on the deck in the morning sea air and stretch until Thaang, our Tai Chi leader, arrives. He comes early and teaches us some warm-up exercises. After that, we head to the gym for some strength training on the machines. At 9:30AM, there’s a terrific Zumba class. Today, however, and maybe for the rest of the cruise, I walked for an hour while Deena did Zumba. I’ve decided to learn a few basic phrases in Japanese, so I put the Pimsleur Japanese course on my iPod. I can’t believe how hard it is to learn a non-Latin language! By the time we hit the sauna, the showers and change clothes, it’s time for lunch. Quite often, we meet people and exchange stories. Or we run into people that we’ve met and enjoy, and have a conversation. Someone has put together an improvisation group. I love doing improv and try to make the meetings whenever they happen. I’ve even talked Deena into it and she (of course) is quick and funny. There’s some talk of actually having a show before the end of the cruise. Deena and I have also found a ballroom dance class the occurs most afternoons. It’s something that we love to learn but hated the idea of buying lessons for an exorbitant price in Fort Lauderdale. In the evening, there’s entertainment. Sometimes it’s a comedian, a singer or a magician. They also have music and dance productions. Some evenings, it’s hard to decide what to do with two great options. Usually, we have a chance to practice our ballroom with a big band. Okay, it’s only five or six musicians, but they call it big band so who are we to argue? Most afternoons, I try to answer emails, get some work done and write this blog. To tell the truth, there’s hardly any time left after all those activities. Now you can see why our blog has been sparse since the cruise started. We’re too busy to write or get bored. Getting the last few things together for Pre Heat which begins this Thursday. Will miss you there . Have a blast at PreHeat. We tried to connect with Japan Burners but it looks like more of the activity is in Tokyo than Osaka where we’ll be. We’ll try a little harder when we’re there (because we brought el-wire with us!). Ah….I was wondering what ‘happened’ to you guys! I’m so glad to hear you are having an amazing time. Much love. He also practiced Kung Fu for many years and is a terrific ballroom dancer. A tough guy told me, "I’ll bet you $10 you’re dead." I was afraid to bet him.